Lashion M. Hinshaw1,2,9,10 [Laston Hinshaw3,11, Lateon M. Hinshaw4, Latt Henshaw1]. Hinshaw, Lashon [unclear], head-of-household, age 28, born July 1871 in Alabama; parents born in Alabama; married 10 years; occupation: farmer; rented farm. 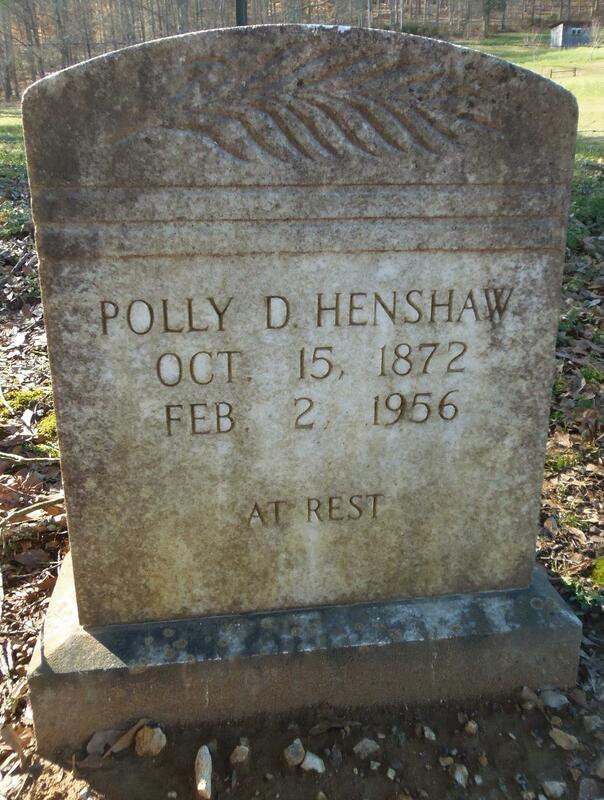 Hinshaw, Poly D., wife, age 28, born Mch 1872 in Alabama; father born in Tennessee; mother born in Alabama; married 10 years; 5 children, 4 living. 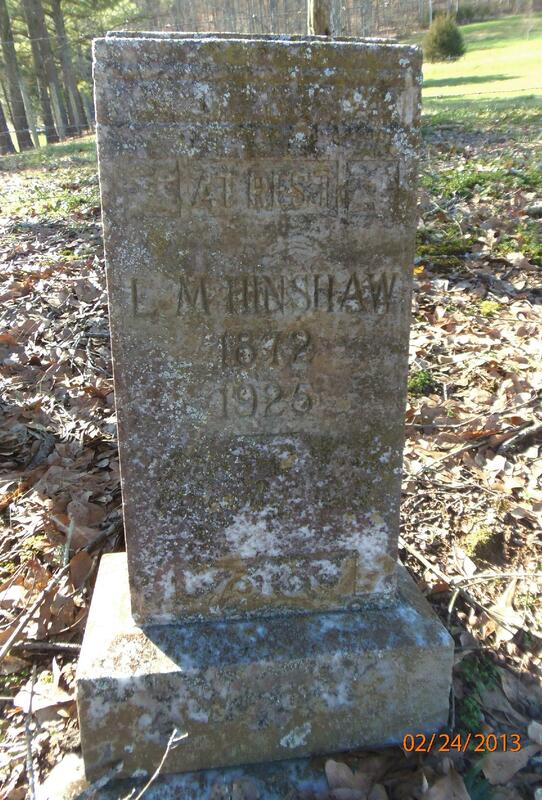 Hinshaw, William W., son, age 7, born May 1893 in Alabama; parents born in Alabama. Hinshaw, Bessie F., daughter, age 4, born June 1895 in Alabama; parents born in Alabama. Hinshaw, Hanna E. [unclear], daughter, age 2, born July 1897 in Alabama; parents born in Alabama. Hinshaw, Claude M., daughter, age 5 months, born Dec 1899 in Alabama; parents born in Alabama. Combs, Hugh, "H boy", age 14, born 1886 in Tennessee; parents born in Tennessee; occupation: farm laborer; attended school 3 months. Hinshaw, Laston M., head-of-household, age 38, born in Alabama; parents born in Alabama; first marriage, married 22 years; occupation: farmer; rented farm. Hinshaw, Poly D., wife, age 28, born in Alabama; father born in Tennessee; mother born in Alabama; first marriage, married 22 years; 9 children, 8 living. Hinshaw, William W., son, age 16, born in Alabama; parents born in Alabama. Hinshaw, Bessie F., daughter, age 14, born in Alabama; parents born in Alabama. Hinshaw, Hannah E., daughter, age 12, born in Alabama; parents born in Alabama. Hinshaw, Flauda M., daughter, age 10, born in Alabama; parents born in Alabama. Hinshaw, George W., son, age 8, born in Alabama; parents born in Alabama. Hinshaw, William T., son, age 5, born in Alabama; parents born in Alabama. Hinshaw, Nola L., daughter, age 3, born in Alabama; parents born in Alabama. Hinshaw, Henry F., son, age 1 year 1 month, born in Alabama; parents born in Alabama. Note two sons named William in the 1910 census (both clearly William, both clearly shown as "son", but different ages and different middle initials). Hinshaw, Lashin [unclear], head-of-household, age 47, born in Alabama; parents born in Alabama; owned home; occupation: farmer, general farm. Hinshaw, Poly D., wife, age 48 [unclear], born in Alabama; father born in Georgia; mother born in Alabama; cannot read or write. Hinshaw, George, son, age 18, born in Alabama; parents born in Alabama; attended school; occupation: farm laborer, home farm. Hinshaw, William, son, age 16, born in Alabama; parents born in Alabama; attended school; occupation: farm laborer, home farm. Hinshaw, Nola [unclear], daughter, age 13, born in Alabama; parents born in Alabama; attended school. Hinshaw, Frank, son, age 12, born in Alabama; parents born in Alabama; attended school; occupation: farm laborer, home farm. Hinshaw, Polly D., head-of-household, age 54, born in Alabama; parents born in Alabama; widow; cannot read or write; owned home ($600 value); no radio in home; occupation: farmer, general farm. Morris, Jesse L., grandson, age 15, born in Tennessee; father born in Tennessee; mother born in Alabama; attended school. Henshaw, L M Mrs, head-of-household, age 67, born in Alabama; completed 6th grade; on Apr 1 1935 was living in the same house; owned farm ($2,000 value). Sims, Hoyt E., son-in-law, age 38, born in Tennessee; completed 1 year of high school; on Apr 1 1935 was living in rural [..blank..]; occupation: farmer, farm. Sims, Nola, daughter, age 34, born in Illinois; completed 2 years of high school; on Apr 1 1935 was living in rural [..blank..]. Sims, Edward, grandson, age 14, born in Illinois; completed 6th grade; on Apr 1 1935 was living in rural [..blank..]; attended school. Sims, Le Roy, grandson, age 8, born in Alabama; completed 2nd grade; on Apr 1 1935 was living in rural [..blank..]; attended school. Sims, Tannis, grandson, age 6, born in Alabama; on Apr 1 1935 was living in rural [..blank..]. Sims, Iris, granddaughter, age 1, born in Alabama. Living next door in 1940 was the family of son George W. Henshaw; one more house away was the family of Latt's cousin Ora Clarence Henshaw; one more house away was the family of Latt's uncle Joseph Anderson Henshaw; two more houses away was the family of Latt's cousin William R. Hinshaw. See also: William Hinshaw #5611 who is buried next to Latt and Polly, and some have speculated that he is an additional child of this family23 (but note that Latt and Polly had two other sons named William). 1900 census, Collins Precinct, Jackson County, Alabama; ED 36, page 207B, line #69, dwelling #48, family #48. Bessie Forest Hinshaw death certificate. Contribution from Kathy Edwards (). 1940 census, Collins Precinct, Jackson County, Alabama; roll T627-40, ED 36-22, page 1A, line #10, household #3. 1900 census, Collins Precinct, Jackson County, Alabama; ED 36, page 207B, line #76, dwelling #49, family #49. 1920 census, Collins Precinct, Jackson County, Alabama; roll T625-19, ED 39, page 1B, line #94, dwelling #15, family #15. Genealogy data (Henall2.FTW) by George Frederick Langley, Jr..